You will be given a reference e-book to read which has 315 pages And the test will be based on that e-book , you can take final test within 1 year of purchase. What is SAP Production Processes? SAP Production Processes is a module of SAP ERP system which is designed to manage the activities of procurement process and planning of the process category of production. Productions Processes allow to collect the information and data for each quantity structure (that is used for each batch or production version) and then use that information and data for evaluation and analysis purpose. Production Processes are generally used for material ledger or actual costing application component as well as in product cost by period component. Quantities which are updated by production process are valued and after that costs resulted from the whole process is allocated to job cost or cost object. It is integrated business production processes management software that primarily provides businesses with a complete solution for all production planning, processing requirements, material management and business mapping with procurement processes activities in efficient manner. This is fully computerized integrated software with all possible production processes and plant installation locations of the business. Through the integration with other modules of SAP ERP (Material Management, Financial Accounting, Cost Controlling, Production and Planning, Sales and Distribution as well as Personnel Management) data is kept up-to-date and processes that are required for production planning, material management, inventory requirements and replenishments, facilities planning, scheduling, order placing, location decisions are automatically triggered in other areas (i.e. requisition of purchase apart from non-stock material in the Material Management or Purchasing Module). 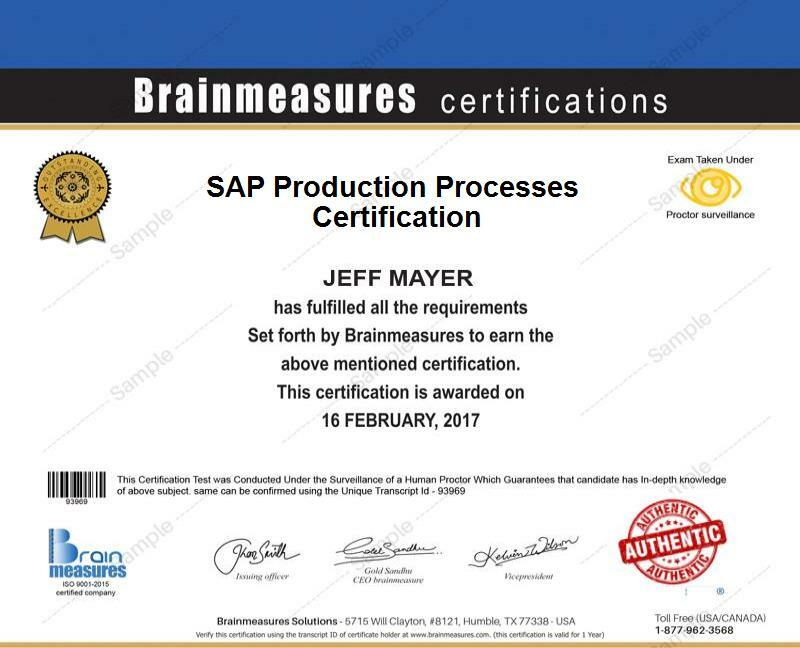 Certificate program of SAP Production Processes from Brainmeasures is a beneficial in terms of providing the required knowledge and skills to grasp with techniques of handling production processes and mentor you how to quickly manage and track your production and related activities in order to smooth business processes. This online certification will provide you distinctive competencies in management of manufacturing processes, production planning with different approaches and strategies, material planning and management, order systems and capacity requirement as well as capacity evaluation. Throughout the course, you will learn about different requirements, phases and sub modules of SAP Production Processes. Apart from the course mechanism and road map towards command over SAP Production Processes system, an online exam is also covered in order to hone your knowledge and expertise about the field. After a successful completion, you will be awarded with the prestigious SAP Production Processes certificate from Brainmeasures. This will be definitely an added skill to improve your Resume and provide the platform to advance in your career path. After getting the SAP Production Processes certification from Brainmeasures with required knowledge and skills, it is also expected for lucrative or handsome salary offerings and increase in earnings of the successful candidates. Recent trends reveal that average annual salary is expected as $56,000-$73,000 per year and this can further lead to increase by $20,000 or more which totally depends on the type of business and related industry with competencies and experience of the candidate etc. This course is specifically designed for those who are involved in production planning, material handling management, plant handling, fixed assets tracking, production scheduling, cost controlling, resource allocation and management of the business with the help of information system. However, it is equally important for students and business researchers, business teachers, professional ERP trainers, ERP managers and IT experts in the field of accountancy, operations management and engineering. Beneficiaries of this certificate program have a vast range that includes top level management, policy makers of business affairs, controller accounts, financial analysts, plant and production managers, plant engineers, production analysts, processes managers, data analysts, ERP specialists, business executives, chief operating officers, business owners, students, teachers, researchers and all business professionals who are directly or indirectly involved in business decisions regarding sources, production processes and plants scheduling.